X-Ray Powder Diffraction (XRPD) is a powerful experimental technique that uses the diffraction of X-rays on powder or microcrystalline samples for the structural characterization of materials [1,2]. XRPD allows for rapid, non-destructive in situ analysis of multi-component mixtures without the need for extensive sample preparation. XRPD can be used to analyze quickly unknown materials and perform materials characterization in such fields as metallurgy, mineralogy, forensic science, archeology, condensed matter physics, and the biological and pharmaceutical sciences. In the field of pharmaceutical powders, XRPD is thus considered as the gold standard method for the identification of solid forms (i.e. polymorphs, solvates, hydrates, salts, co-crystals, amorphous) [3-5]. "SR-XRPD has thus caused powder diffraction methods to enter a whole new world of applications ." 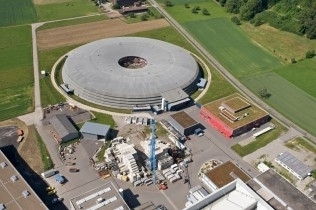 In Synchrotron Radiation X-Ray Powder Diffraction (SR-XRPD) X-rays are generated by a synchrotron facility and are thus at least 5 orders of magnitude more intense than the best X-ray laboratory source. A tutorial on synchrotron radiation and SR-XRPD with exhaustive reference citations can be found on our Knowledge center. The exceptional properties of synchrotron radiation applied to powder diffraction have thus caused powder diffraction methods to enter a whole new world of applications . The high brilliance of the synchrotron radiation has drastically improved the structural characterization and level of detection of mixture components. When combining SR-XRPD with the new generation of solid-state ultra-fast detectors , Level of Detection (L.o.D.) smaller than 0.05% wt. are obtainable with acquisition times of a few minutes. The speed of the measurement makes it possible to perform kinetic studies on structural changes during chemical reactions or under temperature and pressure ramps. The tunability and much wider range of available wavelengths than from laboratory X-ray sources has significantly increased the domain of applications of powder diffraction, for instance to biological molecules [8,9]. How does (SR)-XRPD work ? A powder diffraction pattern is a fingerprint of the corresponding solid form. There is, in fact, a unique and direct relationship between the measured powder diffraction pattern and the structural order of the material under investigation [2,10,11]. ○ The angular position of the diffraction peaks is uniquely defined by the size and dimension of the crystallographic unit cell. ○ The intensity ratio of the diffracted peak is uniquely defined by the location and type of the atoms in the unit cell. ○ The width and shape of the diffraction peaks is uniquely defined by the microstructural properties of the solid form under investigation (e.g. particle domain, strain, defects). The more similar the structure or microstructure of two solid forms the less distinguishable their diffraction patterns (e.g. closer diffraction peaks, similar intensity ratios). The XRPD ability of discerning between two very similar polymorphic forms relies, therefore, on the quality of the XPRD measurement, which in turn depends on the X-ray source, diffractometer, detector and calibration procedure applied. 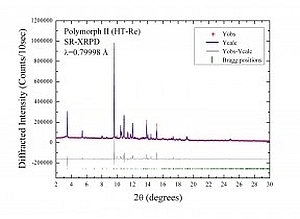 Subtle structural differences between two close polymorphs and/or low concentration of impurities can be totally hindered by XRPD measurements performed with moderately performing equipment. Below as an example we show the 3D crystal structure of the High-Temperature metastable Form II of Carprofen  (courtesy of G. Bruni and F. Gozzo) and its corresponding High-Resolution (HR) synchrotron X-ray powder diffraction pattern acquired with Mythen II detector  in only 10 sec. 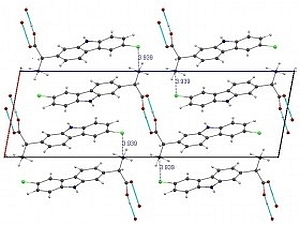 The structure solution of carprofen was not accessible with laboratory data nor its subtle polymorphism due to its isostructural character and configurational disorder. SR-XRPD made it possible. XRPD can be seen as an objective analytical tool for structural and microstructural analyses of virtually any kind of material. Objective means that it does not require the recording of many reference diffraction patterns, as it is for example the case for Near Infra-Red Spectroscopy technique that needs complex spectral libraries and quantitative models to be constructed prior to qualitative and quantitative analyses. A deeper discussion on the topic SR-XRPD vs NIR with extensive scientific references can be found on our Knowledge center page.